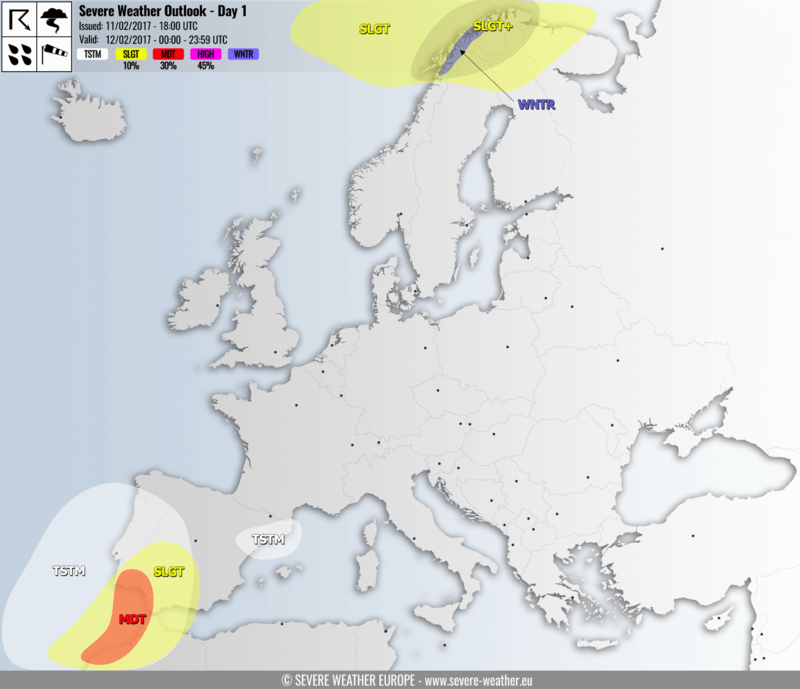 A MDT risk has been issued for extreme SW Spain and towards extreme NW Morocco with threats for severe winds, excessive torrential rainfall, marginally large hail and to a lesser extent for tornadoes. The main focus for dangerous weather will be a sharp cold front pushed from the SW in the afternoon and early evening hours. A SLGT risk has been issued for surrounding areas of the MDT risk across S Spain and NW Morocco where a lesser coverage of severe storms is expected. Threats for severe winds and marginal hail exist in the area. A SLGT+ / SLGT risk hase been issued for the Norwegian sea, N Norway, extreme N Sweden, N Finland and extreme NW Russia with threat for severe wind gusts in excess of 120 km/h. Extremely severe winds can be expected across the SLGT+ risk area, wind gusts locally above 150 km/h. A WNTR risk has been issued for higher elevations of N Norway where excessive snowfall will result from the strong orographic precipitation from the Atlantic.